Have you ever wondered how many new phones have been announced this year? Well, with all the minor and major manufacturers in business worldwide, arriving at the exact number would be a challenging task. On the other hand, we can easily provide you with statistics on how many new handsets have made it into our database over the course of 2014. The figure stands at over 600 and includes phones of all shapes and sizes – anything from the basic-yet-cheap Nokia 130 to the pricey and feature-packed Samsung Galaxy S5. Many were the handsets racing for the category's top spot, but Apple's smartphone was the most deserving among them, in our opinion. Of course, some of you will argue that there are smartphones better than the iPhone 6 – smartphones with better specs and broader feature arsenals. To them goes the reminder that the overall user experience is what makes a smartphone great or not, not the resolution of its display or the megapixel count of its camera. And that's where the iPhone 6 shines – it is thin, light, and well-designed, so using or admiring it is a pleasure. It is easy to operate and highly reliable, with hardware and software working together in seamless harmony. 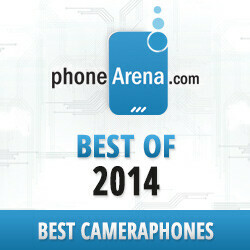 It packs an awesome camera that snaps excellent photos with ease. It has access to the best mobile apps, games, books, and media provided by Apple's app ecosystem. And let's not forget iOS 8 and the multitude of key improvements it brought to the table. All in all, the iPhone 6 is a phone that simply works and does well anything it is supposed to. It may not be a perfect smartphone, but it reaches closer to that point of perfection than any smartphone we've seen yet. As we just implied, specs aren't all that matters in a smartphone. But if a smartphone maker goes above and beyond by putting the best available hardware in their creation, they will definitely get the crowd's attention. Take the Motorola Droid Turbo as proof – with its QHD display, Snapdragon 805 SoC, 20.7MP camera, and excellent battery life, it is one of the best-equipped Android smartphones in existence. Better yet, it is a solid device built of premium quality materials – one that anyone who demands the very best would approve of. On the downside, the Droid Turbo is available solely through Verizon, but given how awesome of a smartphone it is, making the switch seems totally justified. In 2013, we crowned LG's former flagship, the LG G2, as the year's best smartphone. 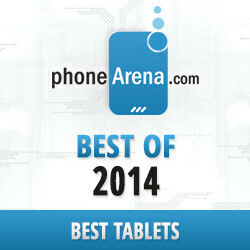 This year, we have the LG G3 grabbing a well-deserved bronze award. In fact, it has been one of our favorite Android models ever since we got the chance to review it in June. Back then, it impressed us with the crazy-high resolution of its screen, with the great performance of its camera, and with the elegance of its UI. Plus, we liked how the LG G3 wasn't too hard to wield despite the gargantuan proportions of its 5.5-inch display. Today, the LG G3 is still going strong and is one of the best value-for-money flagships you can possibly get. Congrats Apple, great and deserving device. Said by you and PA! If this was an unpaid or unbiased article: 1: Nexus 6 2. G3 3. hmm...Either the One M8, Xperia Z3 or Galaxy S5. The Droid Turbo shouldn't be on the list as it is a carrier exclusive and rarely available elsewhere. X is probably only for the North American markets. Z3 sometimes have inferior picture quality than it's competitors. I agree with you about the S5 and M8. Droid turbo should be removed considering old design, G3 should b called a phablet. Galaxy Alpha and Xperia Z3 should be in this list. Come on. Paid by whom? 1.note4 = unique functionality 2.z3 c = superb battery life 3.g3 = all rounder If ain't biased. Xperia Z3 really? Sony phones are all craps. If you don't own a Z3, you shouldn't praise it like a blinded fool. Oh I didn't see you're a Sony fan but here's the Z3 you praise: - Display is the worst compared to every other IPS out there. Touch panel patterns are clearly visible. Color is dull. Cheap protective glass with no anti-glare and no anti-fingerprint coatings. - Stereo speakers sound horrible because of water proofing - Spyware Baidu is embedded with the firmware - Bootloader is locked. Unlocking it will wipe out TA partition which contains DRM keys, camera post-processing software and void the phone's warranty I don't care much about the camera because I have a DSLR with many expensive lens. It's just common sense that you can't pack a quality 20.7MP in a tiny space, hence the post processing software inside the TA partition. I agree this is the best looking phone with awesome battery life. I just wish its display has the same quality of the iPhone 4's which was made with 5 years old tech. I'm not asking a lot (Super AMOLED or IPS+), am I? Fanboy or hater, use your brain if you got one. Um... no. The iPhone definitely deserves to be on the list, since despite how much you pathetic haters bash it, it's a damn good device. I use an iPhone 6; you clearly havent. At first, it may seem small compared to whatever new assdroid phablet's come out, but it really wins you over with all its benefits. For example, apps almost always come out first on iOS, and software updates are a joke on Android. "Oh please Lord Google, make your latest update available to me!" PA isn't paid or biased; you're the biased one, since you're too blind to see the beauty of iPhone. Yaaaaaaaaawwwwwwwwwwn. Rock on Apple, continue making the best products out there. I Object PA ! I Don't care about iPhone 6 . We see it every year ! but don't you think Xperia Z3 is missing in the list ? Or Even the HTC One m8 ? You can't have seen it every year ; it has only been released this year. I mean All iphones , sorry if you didn't understand it . Z3? Lol. Buy one then you'll know. Just don't kill yourself or hurt others when you find out that Sony mobile display is a pos. Touch panel patterns are clearly visible whether the screen is on or off and that's enough to drive me nuts. #1 selling smartphone in the world! The Apple haters on here are all children and have to degrade things they can't afford. They're irrelevant in the real world where Apple's number succeed! Lol... Where is Galaxy Note 4? LG G3 is miles behind it. So biased decision. I would choose the LG over the Note as it is quite a bit smaller, but with a very similar screen. It also doesn't have TouchWiz UI, which is another plus. Note 4, Z3, OnePlus One or M8.. Even the Nokia Lumia 930 is great!... iPhone 6, Seriously?